This week's freebies are totally about self indulgence: free candy, free celebrity gossip mags, free lattes, and free roast beef sandwiches from Arby's. WaHoo the weekend is here! Get a free Butterfinger candy bar if you are one of the first 100,000 to "make a claim" on the candy maker's Facebook page. The truth is "optional," the site says. Share your dob, name, address, email to get a voucher for a free 2.1-ounce candy bar. No purchase is required. Even if you never lost a candy bar, you can have fun with the candy crime scene environment on Butterfinger's Facebook page. Start here. Get a free subscription to OK! Magazine through FreeBizMag.com when you answer a few questions about your job and what industry you are in. Basically, the site offers a popular mag for free to entice you to also subscribe to a trade magazine related to your field. So you'll be tempted to pay for additional subscriptions. There are no strings attached, however. You can get your fill of Brangelina gossip from OK! Magazine for free and you do not have to share your credit card information. 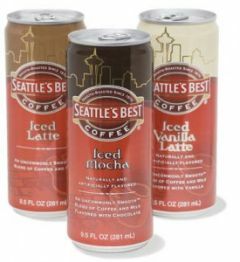 Does your local Target store sell Seattle's Best iced lattes for $1? (A lot of Targets recently cut their iced latte prices.) If so, grab a $1 off 1 coupon from the March 28 SmartSource coupon insert in your local newspaper to get this drink free. Sweet! If the iced latte is a bit above $1, this is still a great deal. ,br/>Get a free roast beef sandwich at Arby's when you buy a drink. Print the coupon here. It expires April 10, 2010. One coupon per order. Caveats: one per person. Valid at participating locations only. Cannot be combined with any other offers. Rite Aid just released a 16-page allergy guide intended to help allergy sufferers recognize their symptoms, avoid having an attack, and treat one when an attack happens. You can pick up a copy in the pharmacy section of Rite Aid, at the counter, or read the allergy guide online. I read the entire thing and found it very helpful in determining the difference between colds and acute sinusitis, which I get a lot. I know, TMI! Read what is in the guide and get an online copy here. Here is a faaaaabulous reason to clip coupons: free Seventh Generation cleaners at Target. There are five steps to get the freebie that will take about 15 minutes, plus the time to get to the store and hunt down these products. You can get them for free or even make money, depending on how many coupons you have and the prices of the items you buy. Here's how to get the freebie.